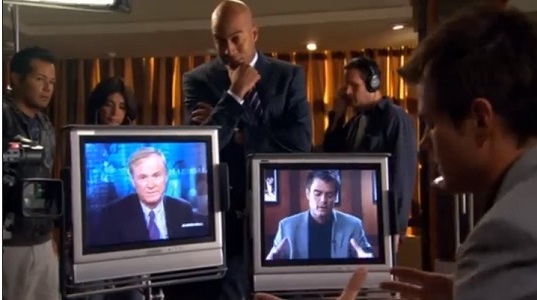 The November induction into the Television Crossover Hall of Fame has traditionally been the month in which the Toobworld Dynamic celebrates the newsmakers. But we also tip our hat to the news reporters, as evidenced by the memberships of Walter Cronkite, Mike Wallace, and Murphy Brown. 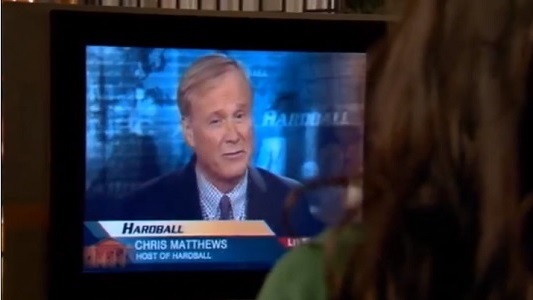 So for this week's November Friday Hall of Famer, we're hoisting 'Hardball' host Chris Matthews for his League of Themselves appearances in several shows. Most of those take place in Earth Prime-Time, but in several other TV dimensions as well. 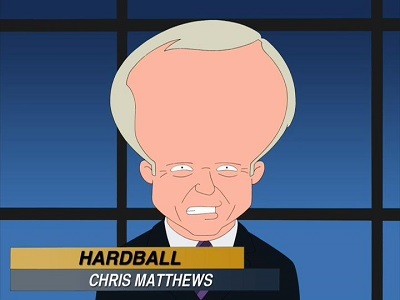 Christopher John Matthews (born December 17, 1945) is an American political commentator, talk show host, and author. 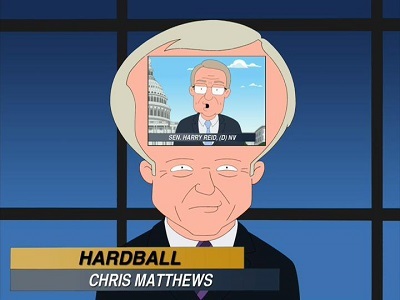 Matthews is known for his nightly hour-long talk show, 'Hardball with Chris Matthews', on MSNBC. 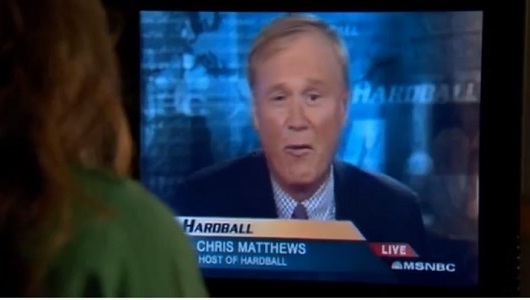 From 2002 to 2013 Matthews hosted a syndicated NBC News–produced panel discussion program on weekends titled 'The Chris Matthews Show'. 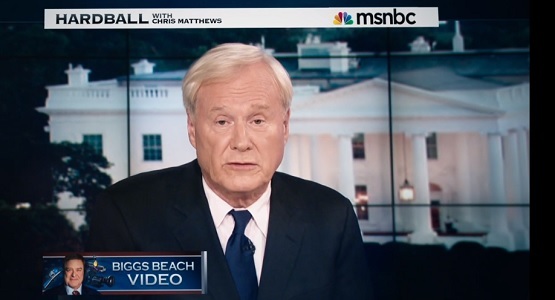 Matthews regularly appears on other NBC and MSNBC news programs as well. 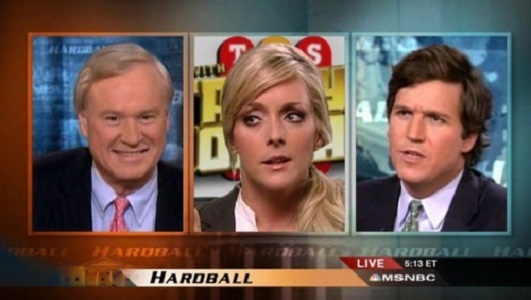 Tucker Carlson, you heard what Jenna Maroney had to say. She supports the troops. Well, here's a question, Chris. Why do we care what she thinks about anything? This woman strikes me as another empty-headed self-involved member of the Hollywood ignorati. You know, for someone who's super super hot, you're really cranky. I have just as much right to my opinion as you or Chris. I'm not sure you do. You've been on the show for 20 minutes now. You sang six bars of something called Muffin Top. And then told a disgusting story about Fleet Week. 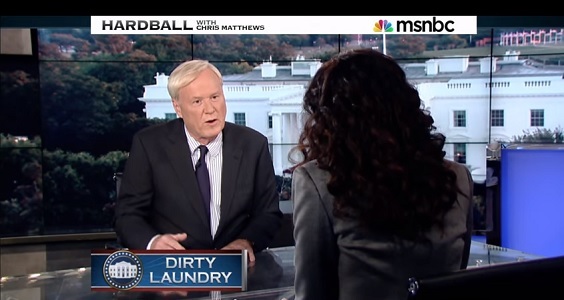 I guess this is the state of political discourse in this country nowadays. And that's fine, let's just embrace it. Let's have our policies determined by former Cable Ace Award nominees. O'Bservation - I have no pictures of his involvement in 'The Event'. I'm not even sure if I should leave that short-lived series in the main Toobworld. 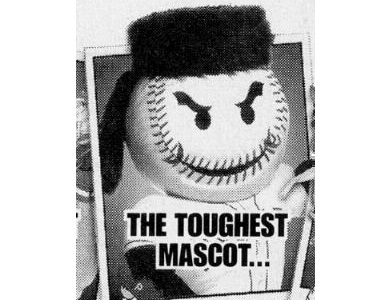 Those appearances alone are enough to warrant membership in the Hall. 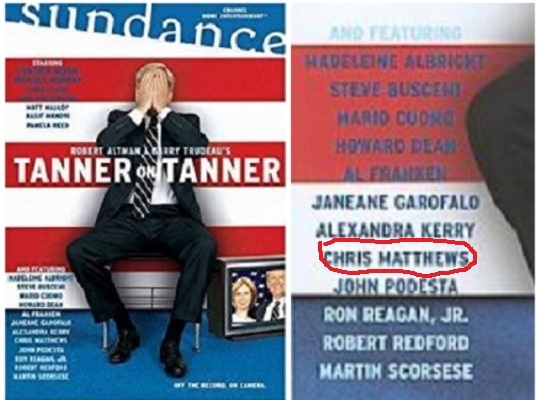 But Chris appeared in other TV dimensions as well. O'Bservation - This could never be in the main Toobworld, due to the difference in the occupancy of the Oval Office alone. But it should share the same dimension as its predecessor, the British original for 'House Of Cards', the Francis Urquart trilogy of mini-series. Toobworld-Dark is different from Evil Toobworld which would be the same TV dimension as the main Toobworld... but EVIL! 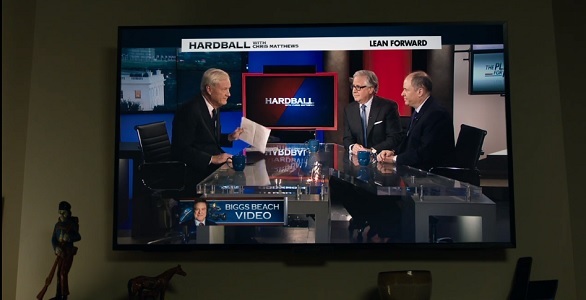 O'Bservation - This is the TV dimension which was created because Josiah "Jed" Bartlet was the POTUS. 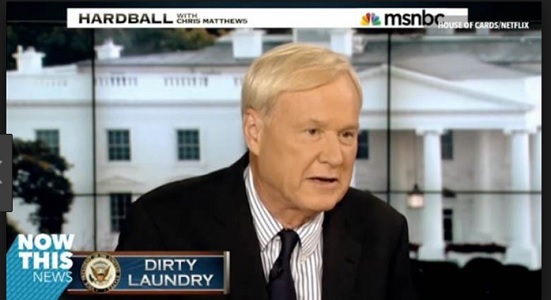 Ironically, Chris Matthews appeared in this dimension first on the spin-off series, 'Mr. Sterling'. 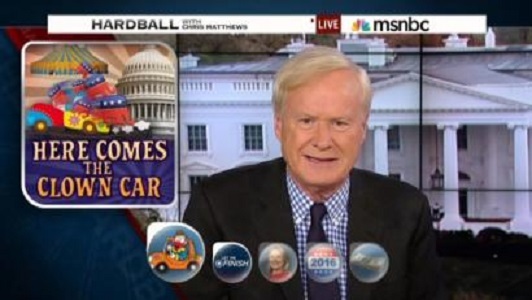 O'Bservation - Only in the Tooniverse could Chris Matthews' forehead be used as a display screen. 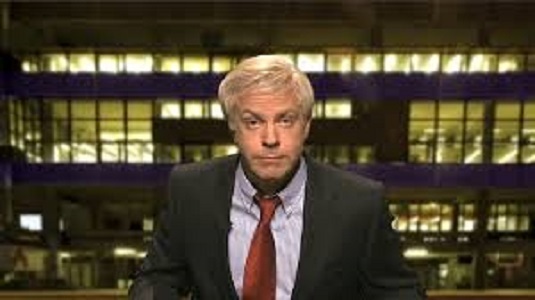 O'Bservation - In the comedy sketch dimension, the looks of an historical figure can change based on whoever is playing the role. No splainin then is needed for such recastaways since it's part of the dimensional makeup. Welcome to the Hall, Mr. Matthews!